We are a general practice law firm representing individual and business clients from many industries and cultures. Our goal is to provide the best legal representation available at a reasonable cost to our clients. We have a proven track record of success in representing clients from Georgia and across the country. We are a general practice law firm representing individual and business clients from many industries and cultures. Our goal is to provide the best legal representation available at a reasonable cost to our clients. 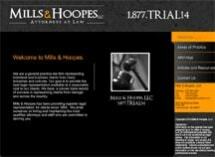 Mills & Hoopes has been providing superior legal representation for clients since 1994. We have a proven track record of success in representing clients from Georgia and across the country. We pride ourselves on hiring the most qualified attorneys and staff who are committed to serving you.